The inn we stayed at was located in a district with lots of small pubs, so you could hear karaoke almost all night long. Another thing was that someone at the inn was chain smoking for most of the night too. The smell and noise made it a rather sleepless night. Still, on Sunday we woke up to, sun! After a hearty breakfast of grilled aji (horse mackerel), nagaimo (chinese yam) with katsuobushi (shaved bonito), a piece of ham, over-easy egg, some tsukemono (pickled veggies), miso soup and rice, we checked with the ferry people to see if they were running and they were (woot!). There was a free shuttle from the JR Hikone station to the harbor, so we did a little galavanting before the pick-up time. 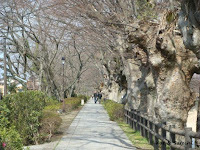 Our first spot was a walkway lined with keyaki (zelkova), these trees are huge! I can only imagine how beautiful they must be with leaves. 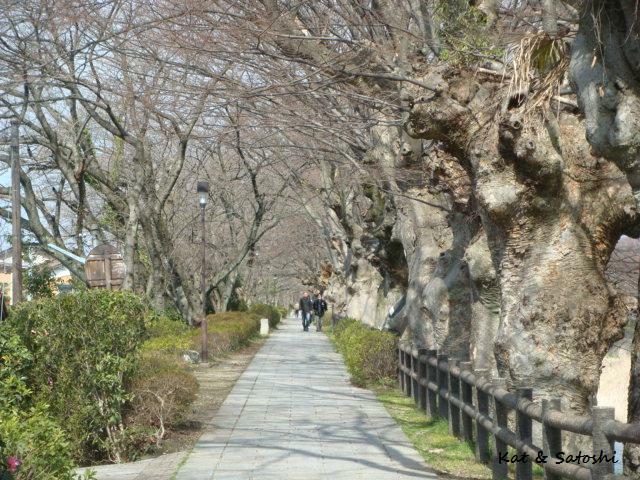 To the opposite side of the walkway were sakura (cherry) trees, this walkway must be beautiful when the sakura is in bloom and the leaves of the keyaki comes in. 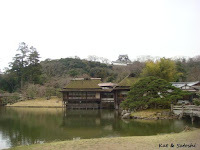 We then went to Daishiji which has a ne-kobo (sleeping Kobo Daishi aka Kukai). 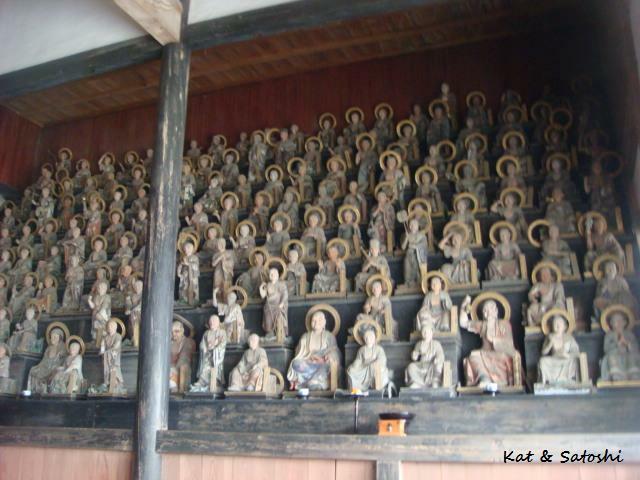 Kobo Daishi was a Japanese monk and is the founder of the Shingon sect of Buddhism. We then caught the shuttle to the harbor. From Hikone, it is about 40 minutes by boat to the island of Chikubushima. And a round trip ticket costs 3300 yen (about US$33) per person. 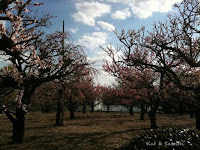 This island is considered a holy place and one of eight beautiful views of Lake Biwa. The ferry to Chikubushima runs 4 times a day, and for each run they give you about 70 minutes to explore the island before the next ferry arrives to take you back. I am not sure if you can skip a run to stay longer. There are a few shops and some small places to eat at the base of the island and things were pricey, but for us, we just went to check out the island. 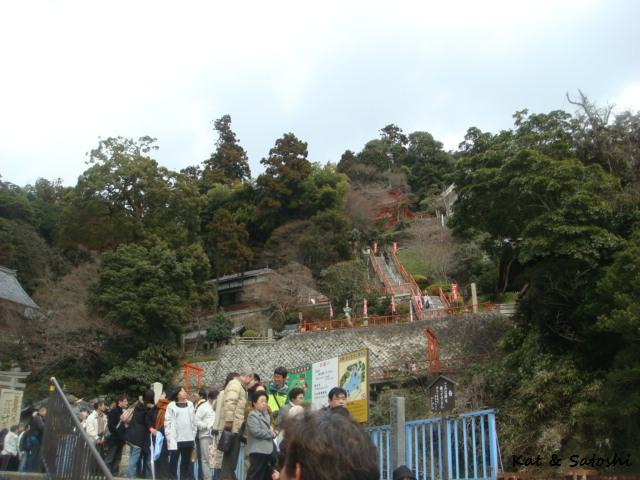 Also at the base of the island you need to pay an "admission" fee of 300 yen (about US$3) per person. After paying your fee, you are met with stairs, lots of them and they were quite steep. This island isn't wheelchair friendly unfortunately. 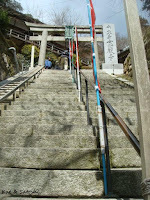 The information pamphlet says that there are 165 steps to the top. I didn't count them, but there sure were a lot. 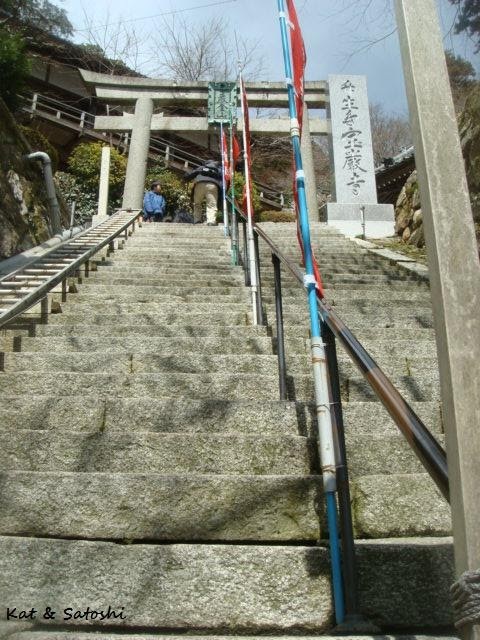 The steps are called Pilgrim's stairs because these stairs lead people to worship. One of the many temples on the island that we stopped at was Benzaitendo which houses one of three famous Benzaiten statues in Japan. Benzaiten is one of the the 7 gods of good fortune and is thought to bring monetary fortune. She also represents music and poetry. There were lots of daruma amulets in the form of Benzaiten too. 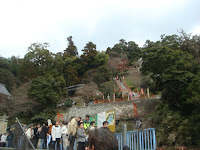 To the east side of the island was a cliff with a torii (gateway). Below were all these ceramic disks. For 300 yen (about US$3), you receive 2 disks. On the first disk, write your name. On the second, write your wish. 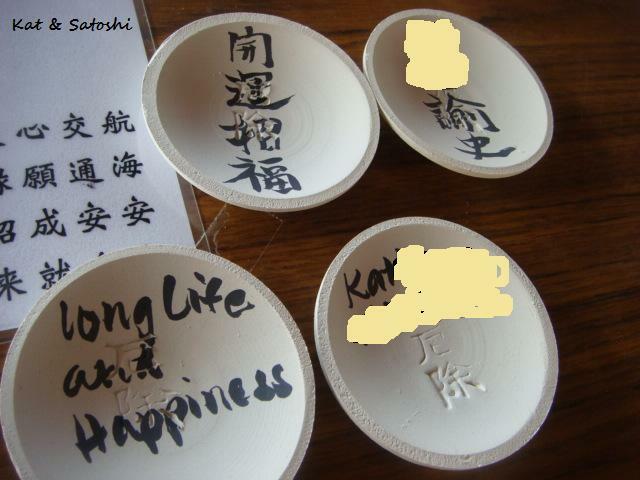 Then face the torii and fling your disks one by one (thinking of your wish as you fling it), if they go through the "legs" of the torii, like an upside-down field goal, then your wish will come true. Most people we saw do this either hit the torii "leg" or missed completely, including us. Just above this area, is a long hallway called Funaroka. This hallway was apparently made from hull of Hideyoshi's boat, the Nihonmaru, wow! There were a few more temples to the east of the island, but we had run out of time. The boat had come back for us, so we returned to Hikone for lunch. Our next stop was Taga Taisha, but the train was on the Sunday/Holiday schedule and only running one every hour, so, we decided to get some lunch while we waited for the train. Yachiyo is a small shop near the JR Hikone station. I chose the kitsune udon and Satoshi had the shippoku udon (which had kamaboko, nori, mizuna, fu (dried wheat gluten), yuba (bean curd skins). I was quite surprised when my udon came out, the aburage (fried tofu) was cut up and not seasoned like most kitsune udon you see. Satoshi was saying that it might have been Kanto (Eastern Japan) style. Still, it was delicious and hit the spot. Taga taisha is about a 10 minute walk from the Omi Taga Taisha mae station. The town is quaint and in front of almost every home you will find these ema (picture amulet). 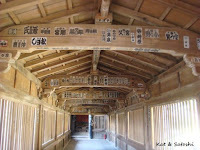 Even shop signs are in the shape of these ema, in fact, the road to the shrine is called Ema-dori (picture amulet road). 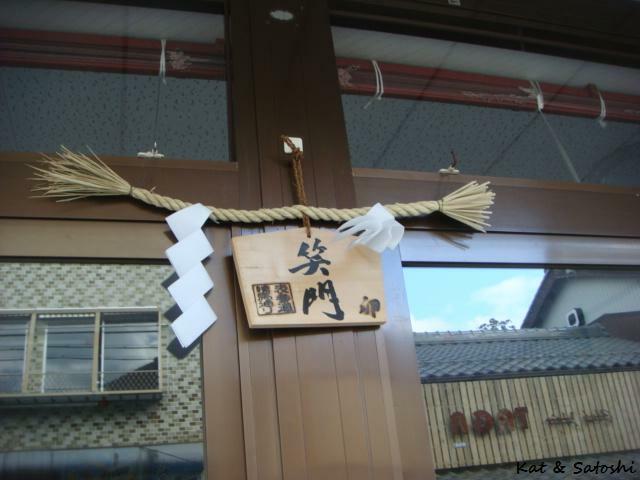 This shrine is known for en-musubi (matchmaking, god of marriage) and is a popular place for weddings. Just in front of the shrine are several shops selling different foods. One item in particular that we tried was ito-kiri mochi. This mochi is filled with sweet bean paste and instead of using a knife to cut the mochi, they use a string to cut each piece. 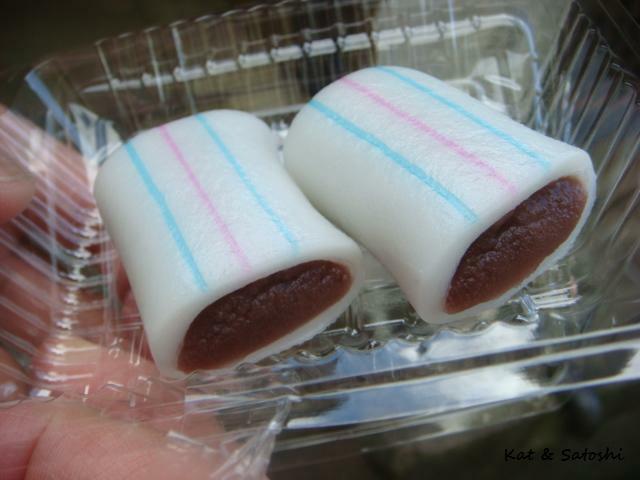 Apparently this is sweet was first created to celebrate Japan's victory over Mongolia way back when. 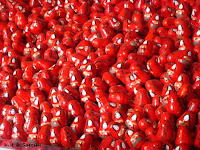 Besides a lot of daruma, we saw a lot of shamoji or shakushi (rice paddles) on this trip. These are considered good luck as you "scoop" up some good luck. 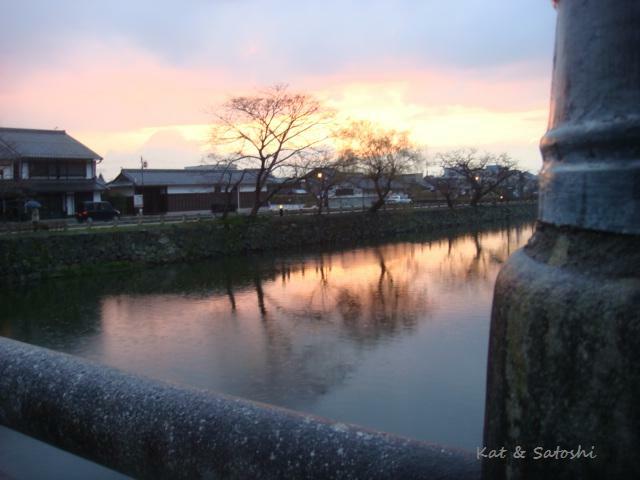 Despite the first two days, our last day in Hikone turned out to be a beautiful day. We were able to see all that we wanted to and got to enjoy some delicious foods. I don't really want to end this post on a low note, but thought I should give you some update on the situation in Tohoku. Apparently they are finding personal items (namely photos) in the rubble, so instead of gathering everything up and throwing them away which would inevitably make clean-up faster, they are sorting through to try to re-connect them with their owners, thus it is taking a little longer. The aftershocks still continue, even in Tokyo, ranging between magnitude 1 and 5, most people they are talking to in the shelters aren't too sure they will return after things settle down, they are too scared, I would probably be too. The news keeps flip-flopping about the nuclear plant too. Grim news. It will all take time to heal. All we can do is hope and pray for the best. Sorry this was such a long post, hope our trip didn't disappoint. Saturday, we awoke to what we thought was a beautiful day. As we checked out, the lady at the front desk had no idea if the ferry to Chikubushima was running, but mentioned that it was quite windy and was snowing...WT? 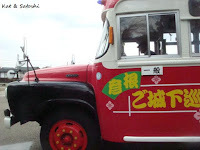 So, we moved our plans to check out Chikubushima to Sunday and decided to take the Isuzu Bonnet Bus around the town to see some sights instead. It was a good thing we did this too because the 20 minutes or more walk to the harbor would have been in vain. We later found out that they weren't running that day (because of the weather). So on the bonnet bus, we found out that this bus only runs during the weekends and holidays. You can pay 200 yen per ride or buy the all-day pass for 500 yen to ride unlimited times. Since we didn't know how many times we would ride the bus, we decided to buy the all-day pass. 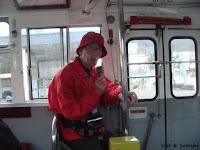 On the bus you will find volunteer guides who give you bits of history and tell you of the sights. This particular guide was very helpful and explained a lot of things in detail. The bus doesn't run too frequently, so it does give you a lot of time to check out the area you get off at. Our first stop was Ryotanji. 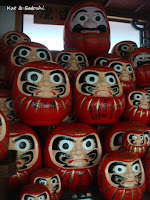 Ryotanji is also called Darumadera (daruma temple) by the locals. 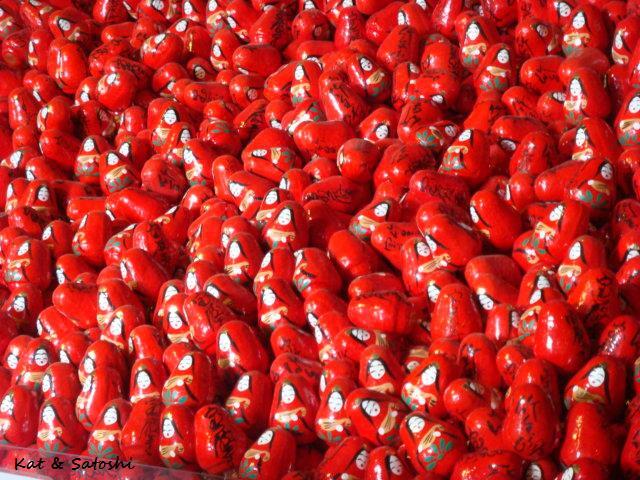 They have a large festival on April 1 and 2 which the prayer room is filled with daruma. Too bad we would miss it. Most times when you see a daruma, only one eye is painted in. This means that the wish has not been granted yet. If you see both eyes painted in, then the wish was granted. At the temple, there was even a 6-foot daruma! which is used for the festival. This temple also had a beautiful garden. 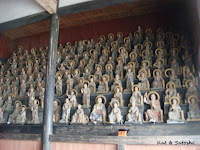 Nearby we also visited Bodaiji & Seiryoji. We got off at the JR Hikone station and decided to eat something warm for lunch. We decided on champon at Champon-tei, which is apparently a famous dish in the area. I got the curry version (750 yen) while Satoshi chose the miso version (700 yen). 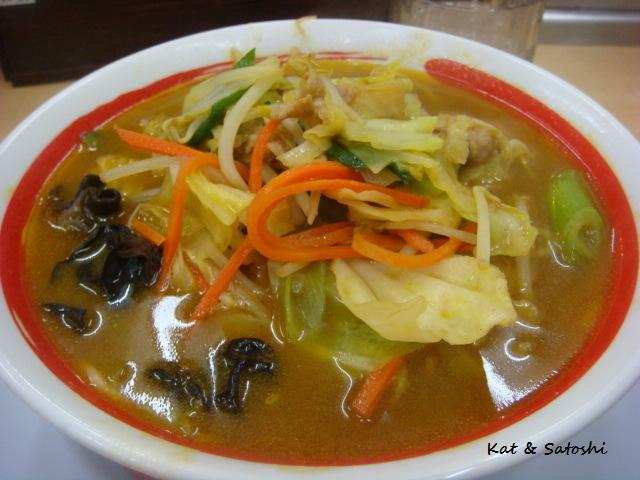 The noodles were like ramen topped with lots of veggies and very tender pork. This was good and really helped us warm up. After lunch, we went to Tenneiji, this temple was not on the bonnet bus's route, so we needed to take the city bus to get there. It was a 10 minute ride and the snow was falling here and there. The first thing we saw here was the 500 Rakan, this was an amazing sight. The 500 rakan are made of wood. It took 10 people to carve them in 5 years and no face is the same. Rakan are the disciples of Buddha. It is said that Ii Naonaka (11th lord of Hikone) executed a woman who was pregnant with an "illegitimate" child. On learning that he was actually the father of the child, he built Tenneiji as a memorial to the woman and child. It is said that if you look at each face of the 500 rakan, you will find the face of someone you have been longing to see. Just outside of this hall, is a large statue of Hotei (Budai in Chinese). 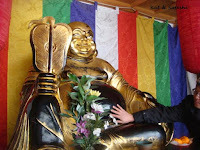 Hotei (god of good fortune), is one of the 7 gods of good fortune. It was made of wood then covered with gold leaf and stands 1.2 meters (4 feet) tall and is 300 kilos (660 pounds). 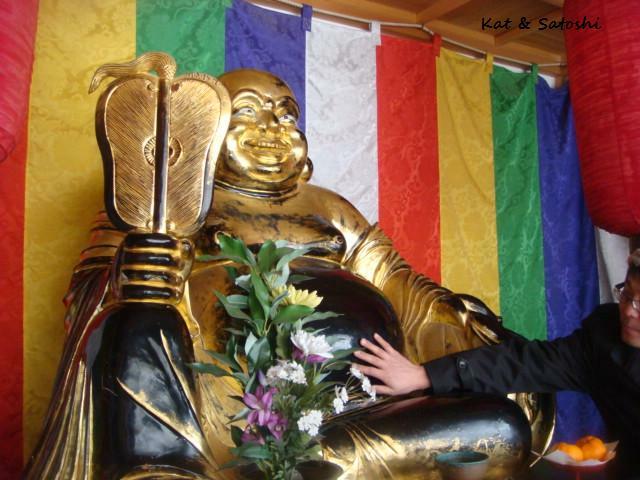 It is believed that if you touch his belly button your fortune will grow and if you touch his fan your luck will grow. It was amazing to see something so large and was more amazing that we could actually touch it too. Since the distance from Tenneiji to the JR Hikone station wasn't too far, we decided to walk back. Unfortunately, halfway there, we were caught in a major snowstorm. The snow was coming down so hard and sideways that we ran for cover inside a gasoline station. Wet and cold, we waited for the snow to stop. When the snow finally started to slow, we began walking back to the JR Hikone station. Since the bonnet bus was on its lunch break, we decided to walk the distance from the station to the castle area, about 10 minutes. On the castle grounds there are turrets and storage areas which you can walk around in. Some have holes in the walls...triangle shaped holes are called teppozama and were used to stick guns out of to shoot enemy approaching the castle. Rectangle shaped holes are called yazama and were used to stick bow and arrows out to also shoot enemy approaching the castle. Another thing you can experience is climbing the almost 90-degree "stairs". Definitely not a place to be wearing a mini skirt or heels, as you will sometimes see whenever travelling around Japan! Makes you also wonder how those samurai did it in those long skirts that they wore along with their long swords. Knowing me, I would've stepped on my own hem...sigh! 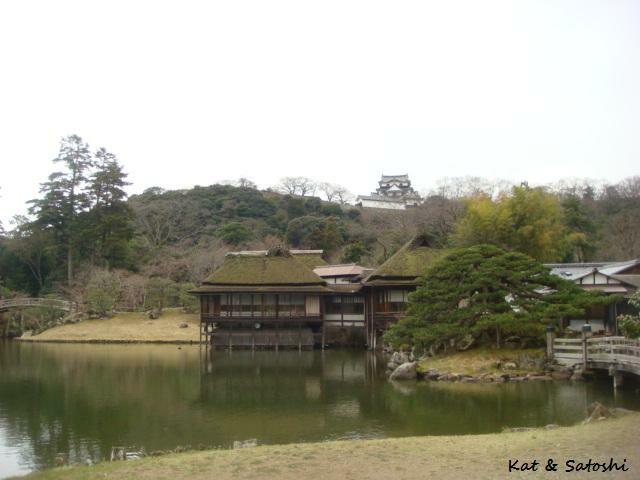 After seeing the inside of the castle, we walked to Genkyu-en, which is also on the castle grounds. These gardens were built in a modern style, rather than be looked at from afar, these were designed to be walked through. Again, we were met with snow, rather heavy snow. To avoid getting totally wet and cold again, we ducked into a tent that was selling local products including this daimyoyaki by Furukawa Hinoborido. 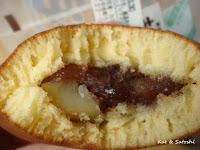 This was similar to dorayaki, the filling was sweet bean and chestnut. We bought 3 for 390 yen. 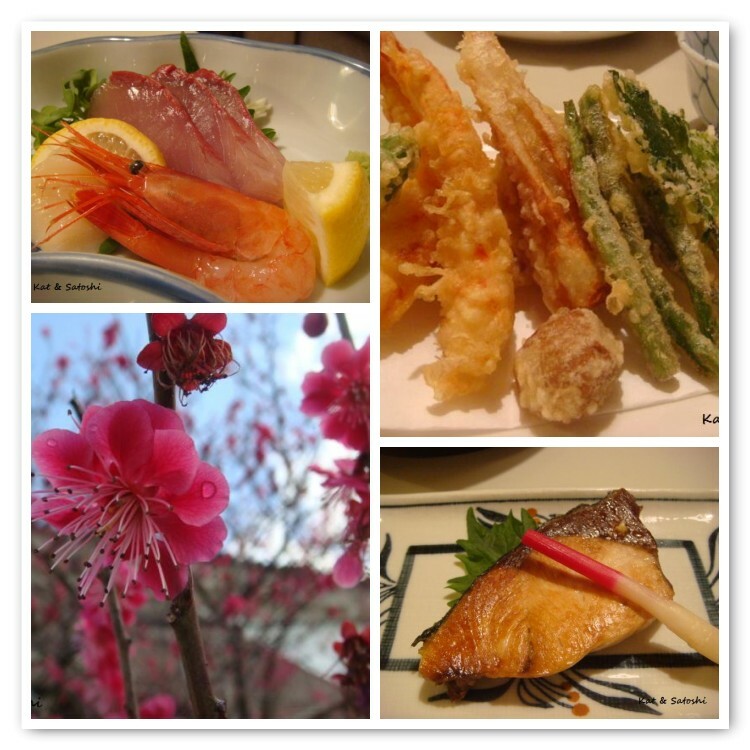 With all the cold weather, stair climbing and walking, these daimyoyaki definitely helped us re-fuel. 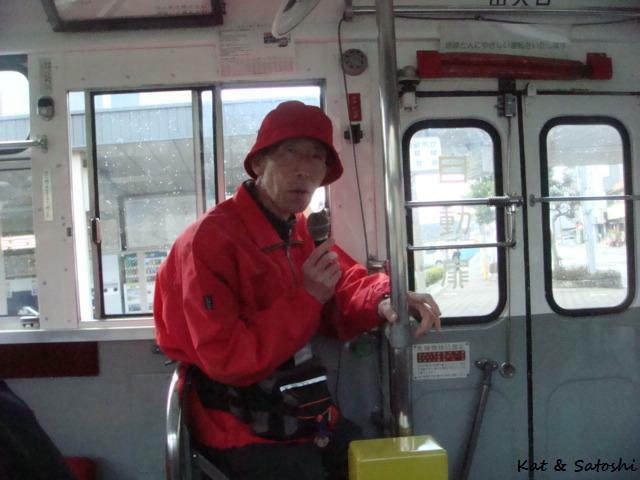 We then jumped back on the bonnet bus which took us to an area called Ginza-machi, a large shopping arcade. From here, we walked to where we would stay the night, the Kiyotaki Ryokan. This tiny inn is family run. Since we were cold and tired, we were lucky to be able to take a bath right away and warm up a little. Most small inns have specific bath times for guests, but since we were early, they let us bathe right away. Dinner was very delicious...fresh sashimi (scallops, yellowtail & shrimp), grilled sawara (Spanish mackerel), komatsuna (mustard greens) with aburage (fried tofu), assorted tempura. The most surprising tempura was the fried umeboshi. At first I thought it was a mushroom, but when I bit into it, it was soft and sour...different but delicious. It was quite a long day, but we got in a lot of sights despite the weather. Friday, Satoshi took the afternoon off and we met up after lunch to go to Hikone. We've gone in the past for family events, and did some galavanting on our own, but it was the first time for us to spend several days there. 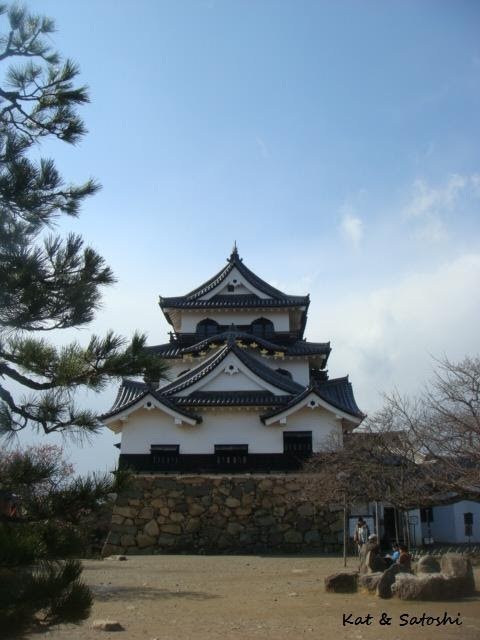 Hikone is located near the shores of Lake Biwa. The weather was forecasted to be rainy, but little did we know that the rain would turn to hail and sleet. When we arrived it was about 17:00 so we went to check-in at the Hikone Kita Art Hotel. We chose this hotel because the next day, we wanted to visit Chikubushima, a tiny island located on the lake. After getting settled, we decided to seek out some dinner but were instead met up with cold, icy rain. It is about a 15 minute walk to an area called Castle Road. It is quite a touristy area, but they have the most choices for meals, especially since we didn't have a car. We decided to check out a steak shop called Yakigyu Takashi. This small shop is only open in the evenings but serves Omi beef, the area's brand name beef. Almost always when you go to an izakaya (bar) in Japan, they bring out tsukidashi (amuse bouche which translates to "stuff you didn't order but need to pay for") on this night we had some fish with a tomato sauce, octopus sunomono (seasoned with some vinegar) & kinpira gobo. 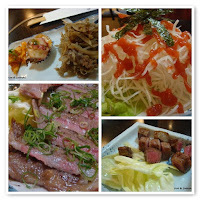 We also ordered a daikon salad with ume dressing, some fried octopus (karaage style), Omi Beef Japanese style and cubed Omi Beef. Everything was delicious and we thought pretty reasonable considering it was their "brand name" beef...total was about 5500 yen (about US$55). As we walked back to the hotel, the rain had stopped, but when we stopped into the convenience store to pick up some water and some snacks, we were met with hail on our way back to the hotel. We're back from Hikone, the weather was...cold. There was rain, sleet, hail & snow...ooh and a little sun. I need to go through photos, hope to post something soon. The weather is still cold and I'm still craving spicy...I tried McD's chili chicken sandwich. Their chili is good and spicy. The chicken was fried, nothing really spectacular but this really hit the spot. It was my first time trying MOS burger's chili dog. It looked a bit skimpy on the chili, but turned out to be just right. Not messy eating at all. 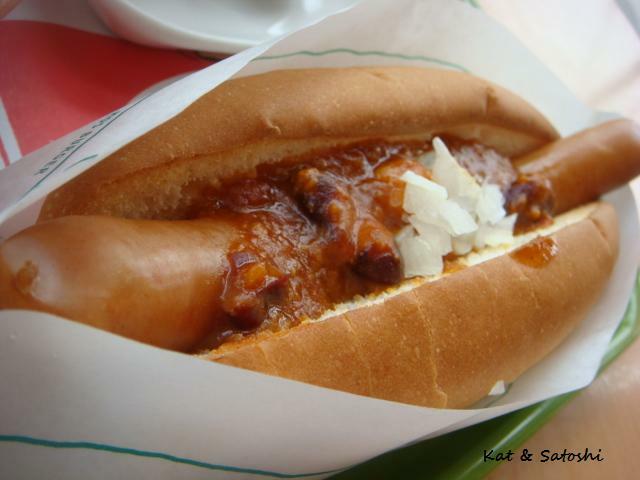 The weiner had a nice snap and the bun was so soft! At 220 yen (about US$2.20), I'd say it was a good deal. Plus, it satisfied my spicy cravings...for now. I'm participating in a charity cookbook project called Peko Peko charity cookbook for Japan. I believe "peko peko" is the onomatopoetic sound your stomach makes when it is really hungry. This project is being coordinated by several bloggers and there is a website up (the website no longer exists). Hopefully the cookbook can be put together quickly, check back here or the website for more info. On Wednesday, the water had been tainted with radioactivity in Tokyo, and there was a mad rush on bottled water. You couldn't even find bottled water in Osaka, in our neck of the woods anyway. A day later, the radioactive levels in the water have gone down...it is now okay to drink the tap water in Tokyo...really?? The government is also saying that the levels of radiation for some seasonal vegetables are safe to eat but the farmers will not be allowed to harvest or sell them, WT? If the levels are safe enough to eat, I think we should eat the veggies and not waste the hard work of these farmers. On top of that yogurt is scarce too, I've heard they were being sent to the disaster areas. Overall, in Osaka, we still do have plenty to eat. Am thankful for this. 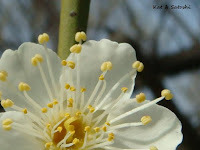 It had been awhile since I went for a walk so the other day, I went to check out the ume (apricot) at Suigetsu Park. 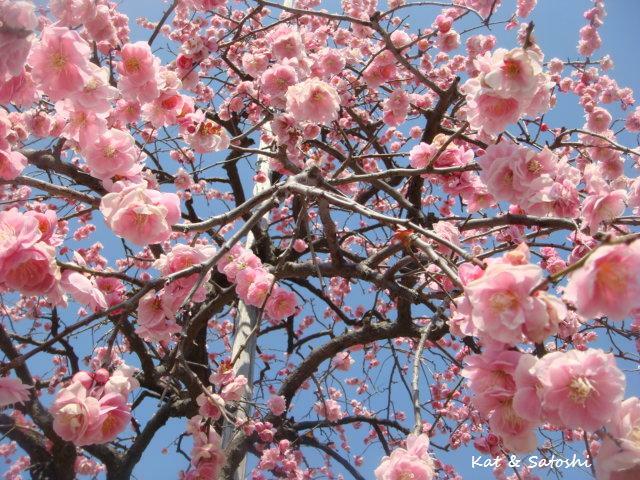 They are in full bloom now, but the wind is still icy even with the sun out. It is Friday and we're starting our weekend early, hope you have a good weekend. While waiting for Satoshi to finish with an appointment that he had on Saturday, I went to check out the new Starbucks which opened inside of Daimaru in Umeda. I think they can seat about 20 people, it was quite small. Luckily I was able to get a seat. I ordered the marshmallow pie chocolate. I think in the States this is called a whoopie pie, but think that in Japanese, "whoopie pie" wouldn't sell, so they changed the name. 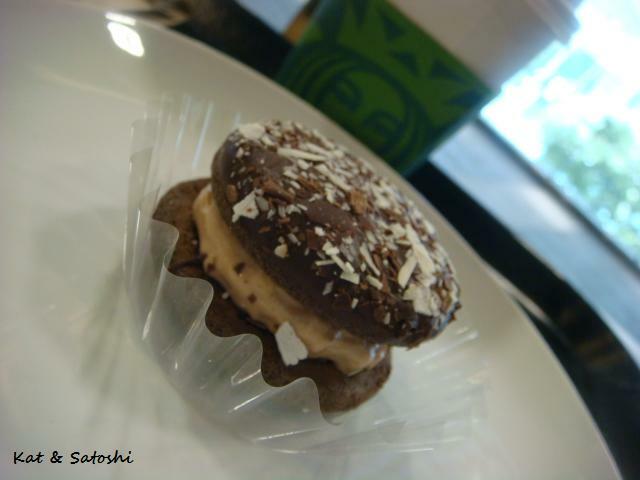 It's cute, like a little macaron, but the bottom cake was kinda soggy. The top was covered with shaved chocolates and the inside had a whipped cream, I don't think there was any marshmallow in there. 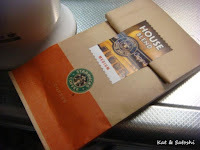 I actually found out about Starbucks through a postcard from Daimaru introducing the various cafes that just opened with their renovation and as part of their opening, Starbucks was giving away 20 grams of coffee when you showed them the postcard. Since coffee prices are rising all around the world, this was a great gift. The weather is still quite nippy, hopefully this is the last week for this kind of weather. I do see some activity on my lanai, some tulips coming up, cilantro. The cyclamen is starting to bloom and the honeybees are out and about...life is good. Saturday, the temperature "soared" up to 17C (62F), it was the only day that was predicted to be nice over the past 3-day weekend, so we went to check out some ume (apricot). 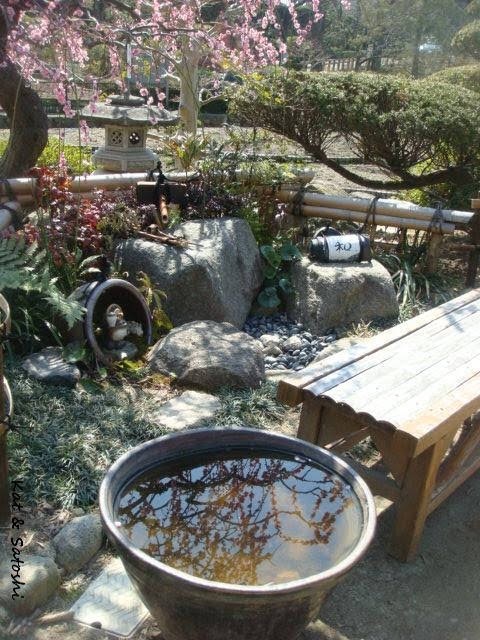 I found a little park online that we'd never been to and told Satoshi we should check it out. He had an appointment to get to in the afternoon, so we went before lunch. 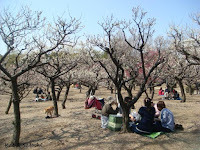 The park is about 10 minutes from the Hankyu Kotoen station and has about 200 ume (apricot) trees. It is a tiny park but there were many out to see the blooms, including a senior group. 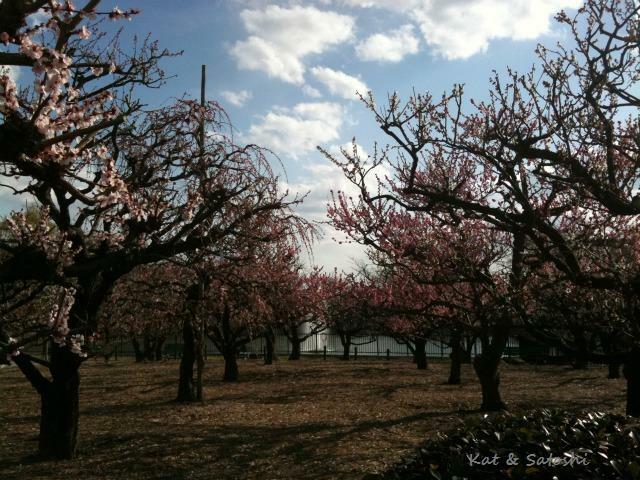 Spring is coming but very, very slowly. Him: Kat, how do I pronounce this word? Him: what about this word? Me: no, see-zuh...you can't say "sh" it should to be "sss"
Him: but I'm saying "sss"
Me: no, you're saying "sh"
Me: I am too and you're saying it wrong. Yesterday was a holiday, Shunbun no Hi (Vernal Equinox Day) but rain was in the forecast, so I planned ahead so we could stay indoors all day. 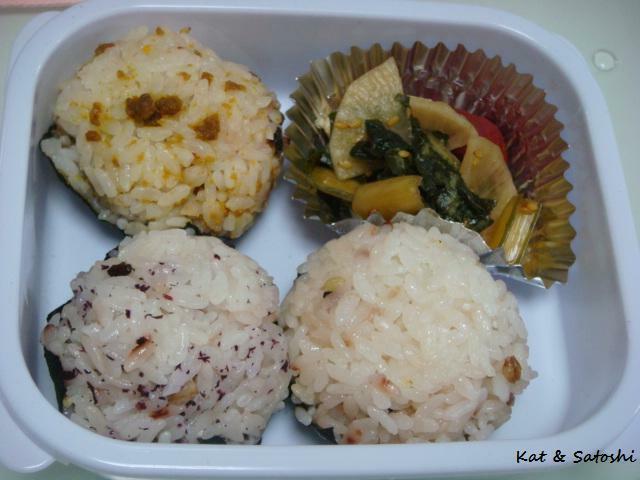 Lunch was something that Satoshi brought home from his business trip last week. 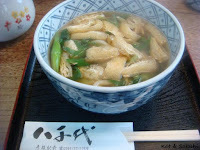 Sanuki udon by Kanaizumi. 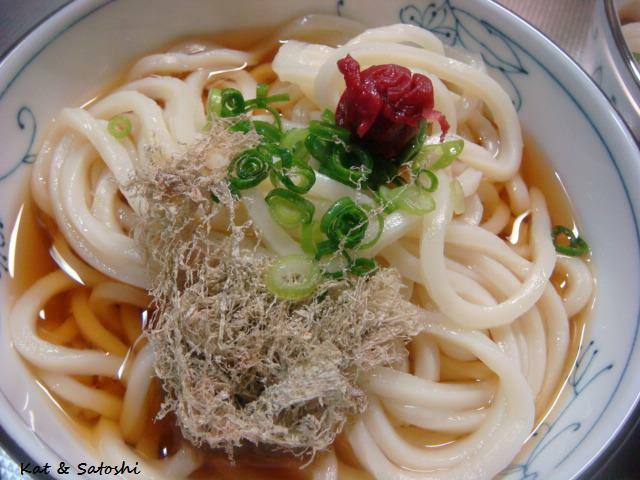 Sanuki udon is a popular dish in Takamatsu which is in Kagawa Prefecture which is on the island of Shikoku. The noodles are a little thicker and stiffer than most udon. This particular set only gives you the udon and sauce, you need to put your own toppings. We added some green onions, an umeboshi & some tororo konbu. Perfect for a rainy day. 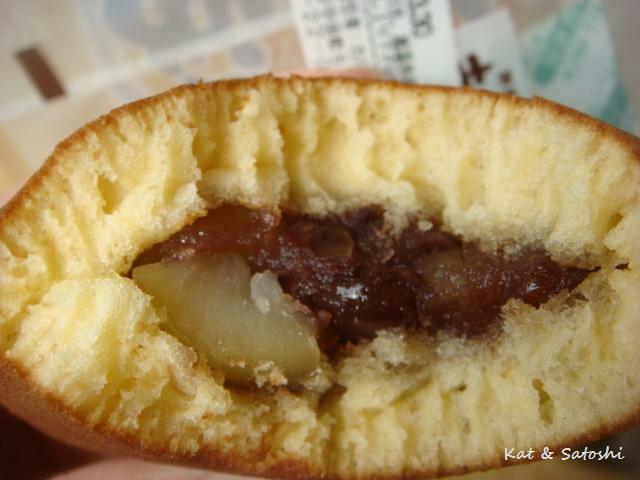 We also had some Ichiroku Tart from Matsuyama which is in Ehime prefecture also on the island of Shikoku. This isn't a tart at all, but a very soft cake made with eggs, sugar and flour (no oil or butter) with bits of yuzu (citron) in it and sweet bean paste in the middle. Very light and perfect with some green tea. 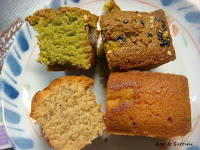 And also some financiers from Patisserie Cafe Tanaka, in Nagoya. 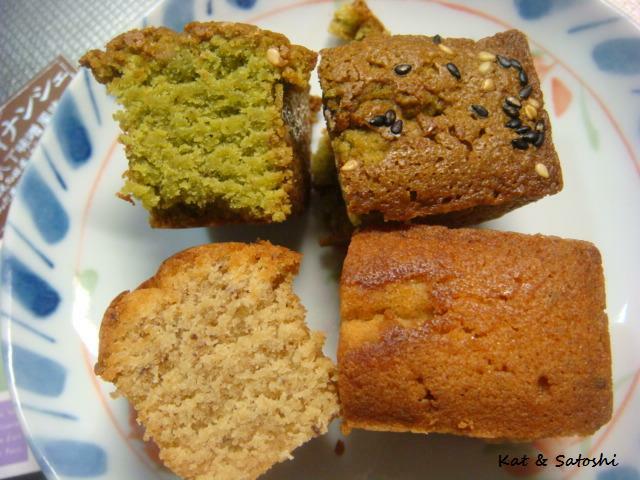 Someone gave me these and one is flavored with Nishio matcha (green tea) and the other is flavored with hatcho miso (red soy bean paste), flavors of Nagoya. And for dinner we had "meat"loaf. There was actually more veggies than meat and I also added some shiso leaves. 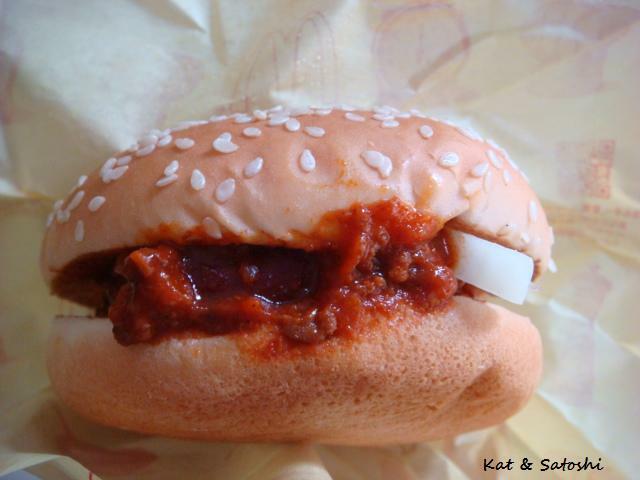 Instead of eating it with ketchup, we topped it with some Japanese tartar sauce. Besides eating, we had several naps and caught up on videos that we hadn't watched. People are still looking for their loved ones, these stories are the hardest to watch or hear about. On a positive note, one prefecture in the disaster area has given residents bicycles that were abandoned or parked illegally. Since gasoline is so limited, they figured that getting around by bicycle would be a good means of transportation. They asked bicycle shop owners in the area to help "fix-up" these bicycles, adding air to tires, and started giving them away. These days we've been eating a lot of rice dishes. 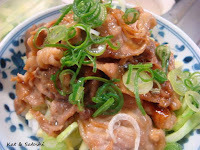 I especially like donburi (rice bowl dishes) (because there are less dishes to wash afterwards). I also like using pork. Thinly sliced pork marinated in some pre-made yakiniku sauce. Wilt some sliced cabbage then cook the pork. Top everything with green onions. Another donburi was inspired from kimu-taku yakimeshi. 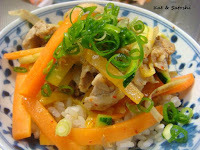 I sauteed some whittled gobo (burdock), carrots & zucchini in sesame oil and added some pork. When everything was coated I added some tsubozuke & kim chee. Put over rice and top with green onions. Fast, easy and delicious, my kind of cooking. Hope you have a good week. First off, the news is sort of "weaning" itself and has gradually brought back some regular programming, though I think most of the shows they are showing are re-runs. There are still a lot of people missing and supplies are starting to trickle to the needed areas. It seems that the roadways and railways aren't back to normal yet, which is causing most of the hold-ups. And gasoline in that area is very, very limited. Making things even more difficult. I'm glad they are getting the nuclear power plant issue in order and it seems that there is radiation in some foods from that area, but we were reassured that the levels are low. Regardless of what the government says, people all over are still stock piling food and toiletries (namely toilet paper). In Osaka, though, it is pretty normal. Yesterday many schools and universities had their graduation ceremonies. 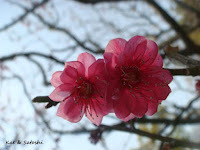 There were many girls dressed in kimono. It was kind of nice to see many people out and about. 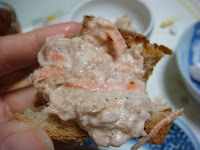 I wanted to share with you a new way to make tuna sandwich filling...add grated carrots. It may not be something new to you, but I learned about it when it was in a sandwich I had at Starbucks, though their version had grated onions too. I thought it would be a good way to get more veggies in. 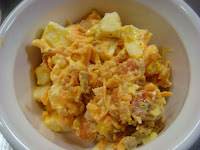 I figured if it was good with tuna, then why not try egg? So I tried it and also added some smoked salmon that had been in my freezer for awhile. Both versions are good. I think even adding grated cucumber would be nice too. 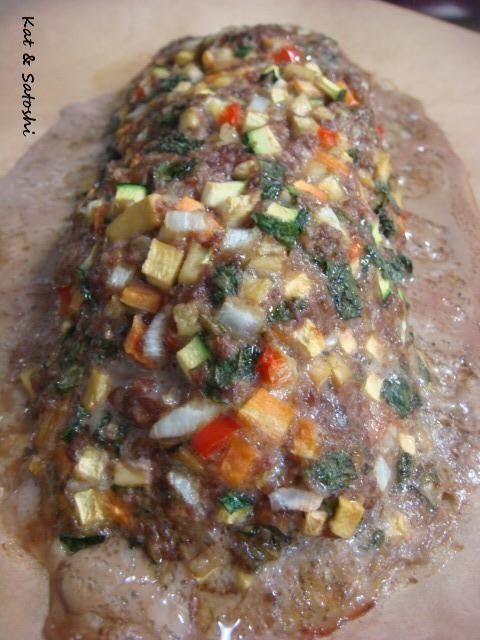 Do you have a different way of making tuna and or egg filling? How is your sugar packaged? 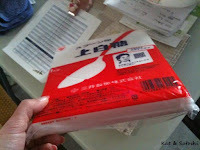 In America, my mom buys her sugar in a 5 pound, rather durable paper package. In Japan, our sugar looks like the picture above. The largest amount I've seen in the markets is 1 kilo, about 2 pounds. The plastic around the sugar is so tight that it is quite hard to get the sugar out of the bag. Most times while transferring the sugar into my container, I end up spilling some. I have a feeling that they package sugar this way for storage purposes. It won't take so much space on store shelves. I imagine drugs in kilo form look similar to this. The weather is supposed to warm up today then we'll have rain for a couple of days before going back to cold weather. The mood in Osaka is pretty much normal, people are out and about. Here and there you can see people stocking up on toilet paper, facial tissue as well as bottles of water. Yesterday we had snow and flurries. I think Spring, if and when it gets here, will be very, very short this year. 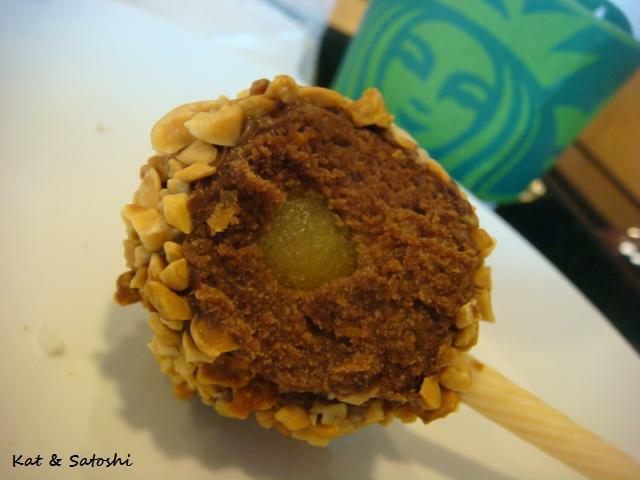 Since I had an appointment in Osaka, I tried one of Starbucks' new cake pops, I think it came out for their 40th anniversary. This one seemed like chantilly cake with chantilly frosting in the middle...pretty good but expensive at 200 yen (about US$2) for one. Supplies and help to shelters are still being hampered by bad weather and bad roadways. On top of that, gasoline is very sparse in the area. Many survivors want to leave the area to stay with family members outside of their prefecture but can't because they have no gas for their cars! Some in shelters froze to death because they don't have enough gas to heat the shelters properly. Kind of an ugly cycle, hopefully it all can get sorted out soon. Some people have offered me places to stay to wait out this nuclear power plant thing, and I am thankful for your concerns. For myself, I am not too worried, I believe they are doing what is necessary to keep us safe. It is Friday here, we have a holiday coming up on Monday, I hope your weekend will be a nice one. UPDATE: got another e-mail from my friend in Sendai, they are out of the shelter and back in their home, they have electricity but no gas nor water. I have asked them if they need anything and hope they respond. 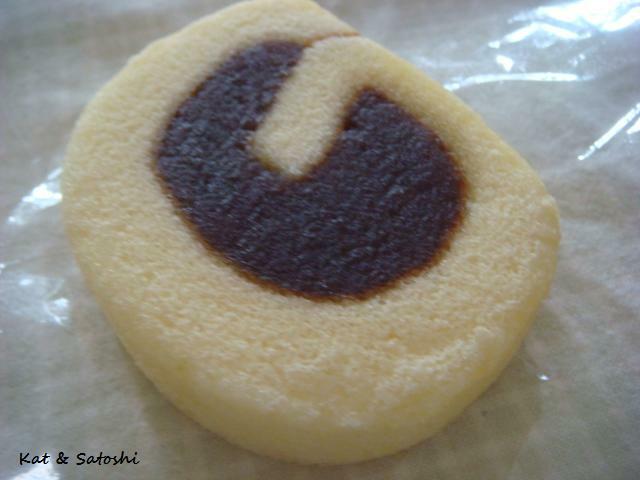 These cookies were made last Friday before the earthquake/tsunami. "Chocolatiest Crinkles" by Lori Longbotham. The original recipe makes 4 dozen, which is not an amount I need to have around this house. So, I cut this recipe to 1/4. After putting most of the ingredients together, I realized that I didn't have white sugar, I went to the market to get some. In some ways, I think it was sort of a sign. Since we were low on rice, I was able to pick up a bag as well as some other groceries. 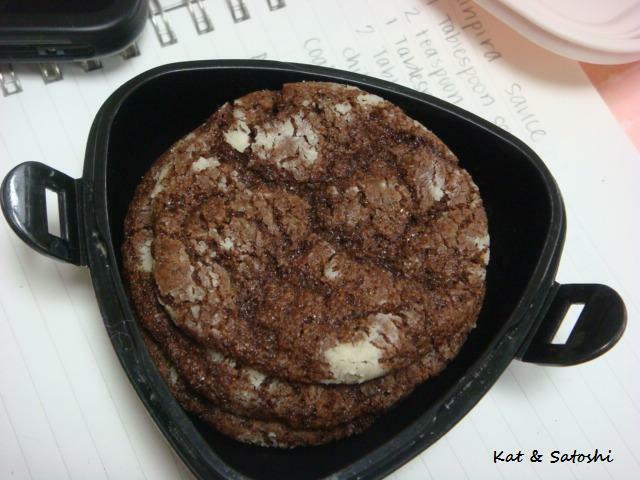 The cookies turned out good, chewy and a little crisp. In the afternoon, the earthquake and tsunami struck and over the next couple of days many people started hoarding food and supplies especially in Tokyo. In Tokyo, they are also having mandatory power outages. The government is asking everyone not to hoard especially gasoline/oil because they need it to help the rescuers and for heaters. Many shelters are not heated because there is not enough fuel. Today in Osaka we had flurries, some hail and sleet, though it was nothing in comparison to the disaster area in Tohoku, they had snow which hampered efforts. Hopefully supplies can be distributed to those who need it, I've heard they were dividing 1 musubi (rice ball) amongst 4 people at some shelters! Hopefully I'll never have to use what is in that bag. Just want to shout out to my blog friend, Michelle and say "thank you" for brightening my day. She had told me she was sending me something small, but with everything going on over the past couple of days, I had forgotten and was pleasantly surprised with all these goodies. Lobster infused oil, which she says is great on pasta. 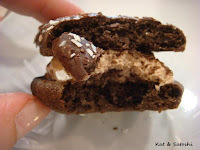 Murray River Salt, Malteaster (milk chocolate bunnies filled with malt candy...yum!) & Choc Chip Chai by T2. *I've already tried the malteaster and chai which is strong with clove & star anise..both are delicious. 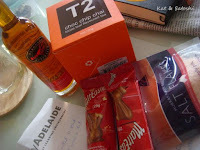 All the items she put into the box are products of Australia. This was indeed special and a nice change of pace. 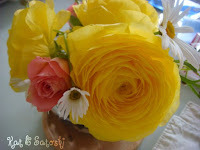 (Ranunculus, daisy & rose) Still no word from my friend in Sendai. I tried calling but couldn't get through, I think the phone lines are still down. In Tokyo and the surrounding prefectures, they are having planned blackouts in order to cut down electricity usage. In Osaka, we are asked to conserve electricity as much as possible too. Since television is limited to updates, we went to bed at 21:00 last night. From what I understand, today several of the nuclear tanks exploded causing some radiation to leak, hopefully they can stop this from becoming yet another disaster. Even though things don't look too good, we're trying to keep positive, hope you are too. UPDATE: I just got word that my friend and her family in Sendai are fine. Thank you! for all your prayers and good thoughts. Please continue to pray for those who haven't found their loved ones/friends yet. "Kibun tenkan" literally means change of feeling. Most people use this phrase to mean a change of pace. We really needed it over the past couple of days. The horrifying scenes on the television were and still are unbelievable. We can't believe it is in Japan that everything we are seeing has happened. We feel helpless not being able to do anything. Watching everything starts to get us down so we need to get out, away from the television, kibun tenkan. 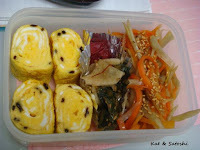 We packed a bento and headed to Suigetsu Park. 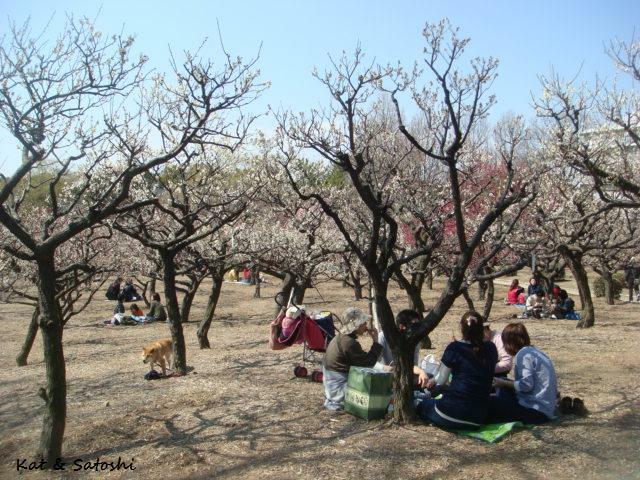 Many families were sitting under the trees enjoying the apricot and peach blossoms. 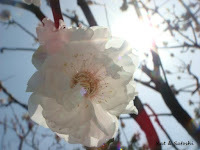 It was a beautiful day, sunny and warm. 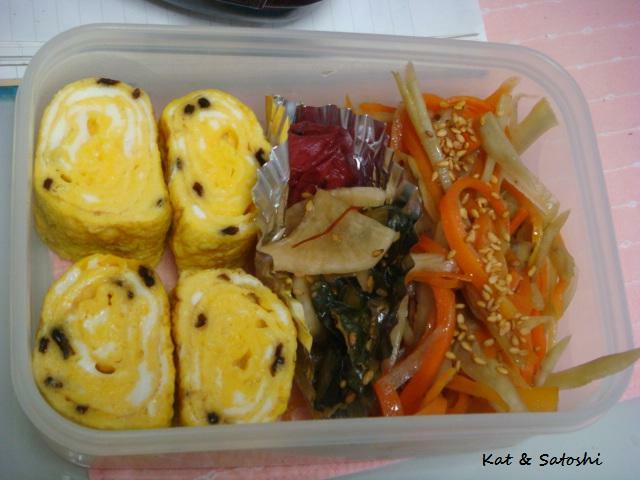 Lunch was tamagoyaki (rolled omlette) with shiofuki konbu (seasoned kelp), kinpira, yatsumi-zuke, umeboshi (pickled apricot). 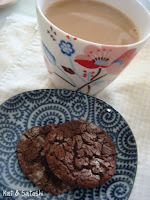 For dessert, chocolatiest crinkles and some green tea. The news on the earthquake has been going non-stop. Hopefully I will get word from my friend soon, most of the phone lines in the area are down I am told. I hope your week will be a good one, keep the affected areas in your thoughts, I will too.